A kind friend picked me up this morning to go for coffee at another friend's new cottage. It is such a lovely cottage, built in the 1930's. It has been modernized and bits of beachy colors added here and there, but it still retains the warmth and feel of a beach house. High ceilings painted aqua, open rafters, pine walls. a real fireplace! Lovely. Another friend from our quilting group drove me home after we had a bowl of homemade vegetable soup at her home. When you need to feel better, the warmth and caring of good friends envelops you. I felt at peace when I came home, and rather than head to my sewing room, I sat at my kitchen table and finished a leaf sketch that I had started at breakfast. The world outside is covered with golden, orange and red. the leaves are falling and covering the back yard. These two drifted onto my deck, begging to be studied. I made zucchini muffins, some chai tea and sat down for more sketching. Last year around this time I did a piece of fiber art featuring Indian Island here in Bathurst. You can see it in my header next to my picture. I'd like to do again with more of the fall coloring in it. I've sketched a possible view. I like the golden colors and the grasses that were growing on the shore in front of me. 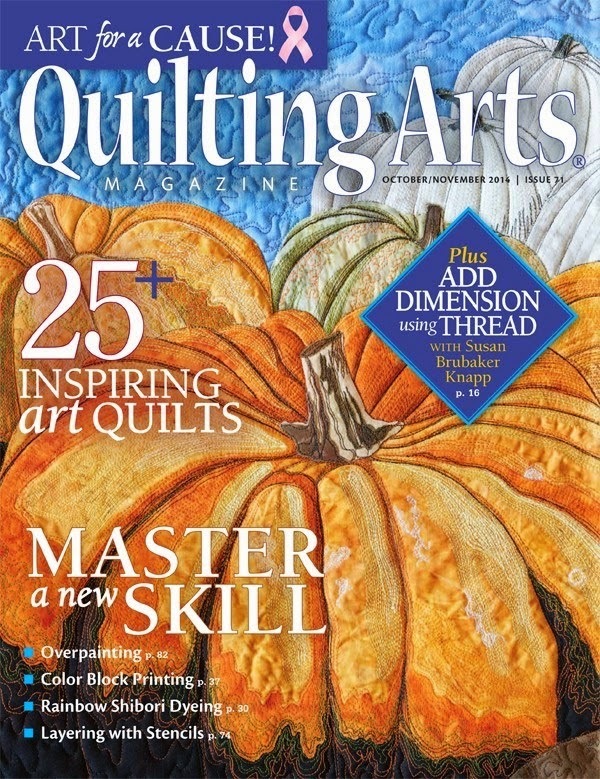 The beautiful thread stitched pumpkins on the cover of the most recent, October/November Quilting Arts reflects the colors and fell of the season. I feel so excited and honored to be in the company of such artists. My article is on page 82. We had record breaking temperatures on the weekend--28C here yesterday--and since it seemed too windy to put the kayaks out, we decided to head to the golf course. I've not been able to walk the course for a while now, but even using a cart is become a challenge. However, a busy day meant slow play, so I was able to rest in between. I sat through one hole and stopped now and again to take pictures. That and a couple of Tylenol before heading out meant I was able to have a few good holes. The course was littered with leaves and it was a bit of a challenge to find even a good ball at times. It was nice to get out though. Today, I took my time getting up, and then as I usually do on Mondays, I picked up, did some wash, and vacuumed. Yay, done for the week! I took a rest after lunch with a cup of tea and my drawing supplies. Ha, I just noticed, that my husband picked a shirt to match the fall leaves. Afterwards, I headed to my sewing studio where I sorted a bit and added the final touches--the zigzag edging and yarn tails-- to the book marks. Done. That's the last you'll see of those. There. Now I feel as if I've accomplished a few things today, a good way to start the week. I can take my rest now before I start dinner. Once I decided that I could walk a short distance with my poles, I've been thinking about where to go. After I brought my husband home from work around 3:00 today, I packed a sandwich and headed off to Daley Point, a local bird sanctuary where there are some beautiful trails. I made it to the lookout, passing this view along my way. I took the same photo last year, but a little later in the season. I must return. Next time, I'll have to pack some bird seed. 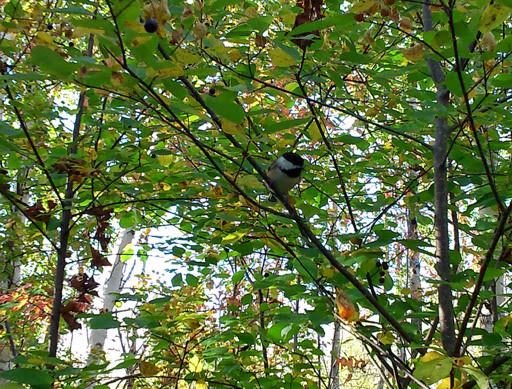 The chickadees were looking for it. It's so good to get into nature a little bit. Then I come home, make tea, grab the ice pack for my hip and look at my photos. After being a bit frustrated by not being able to get out walking, I decided last night to drive to the trail instead of walking the short distance as I would have without the hip problem, taking my camera with me for a photo shoot. I strolled a bit with my walking polls, stopping every now and then when something caught my eye. 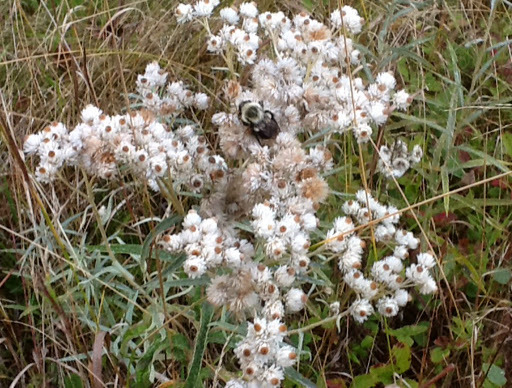 A few wildflowers are still clinging to their blooms. The mountain ash berries always catch my attention. Then there is the pretty patterning of the changing ferns. I love the bits of green that still flow through the veins of the leaves. I can see why I have such a fixation on birches in my fiber art. I'm sure there will be more to come. I took a few dozen wonderful pictures and will have many for future reference. I'm feeling better knowing that I can still get out a bit into the trails and went to sleep at peace last night. This morning, I tackled this monster zucchini, grating some to freeze, and to make a gluten free chocolate zucchini loaf that I'm trying out for my daughter. Of course I had to sample it! It tastes good! I may have to make another one. After that, I've been playing in my sewing room, having a bit of fun with my bookmarks. I'm a bit looney, I think, putting all these details into little bookmarks, but it's so fun when it's nothing serious. I think you feel a bit more freedom to just pull out any fiber bits. Does lace go with canvas? It does now. How about some Angelina fiber? I reined myself in and called them finished, adding a backing and doing a zigzag border around the first one. I don't do them for sale. I'll stash them away to be used for gifts. Only having so much energy in a day, I decide what activity I will do as my day unfolds. I'm limited in my physical pursuits right now while I wait to see the specialist for my hip and knee. I'm told I should hear in a few weeks. I miss taking my camera along on my trail walks. As compensation, I decided to do a little work outside today. I chose a corner of my humble little garden border that I can see from my deck and kitchen window. Using a great ergonomic weeding tool, (it's just there on the left)I cleaned it up a bit, pulling a few weeds. I'll add some mulch later with a little help from hubby. The crooked pole is a clothesline pole. There is a beautiful birch tree on the neighbor's property behind the border garden and hedge that houses birds, and sways and rustles in the wind. I never tire of observing it through all the seasons. I suppose some day we shall have to worry about it falling. We also have an apple tree in the middle of the yard that is another bird haven. It is also my view form my kitchen window and it allows us more privacy on the deck. No the rails are not quite finished yet but it's all useable so, I'm not complaining. When one has limited mobility, one compensates by looking more carefully at the textures and colors in one's own space. I've re-discovered this little hidden patch of lichen against the fence behind the hedge Perhaps it will be inspiration for a fiber art piece. I believe they're called British soldiers. And I love this lichen growing on the apple tree. After the gardening, I skipped the sewing room and made muffins instead. Banana. date, walnut, yum! 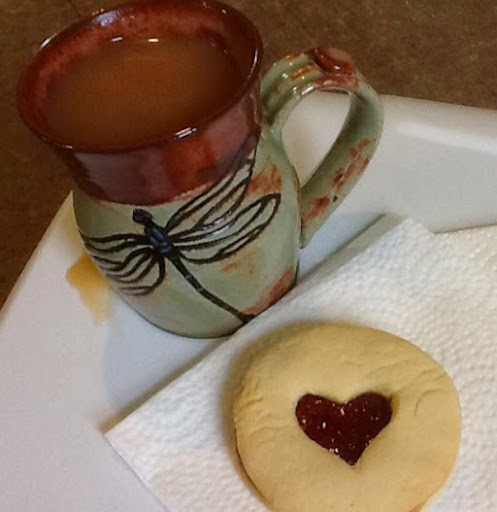 Perfect with a cup of chai spice tea. Well, that's my day. i must go get dinner started. I hope your having a great Tuesday! 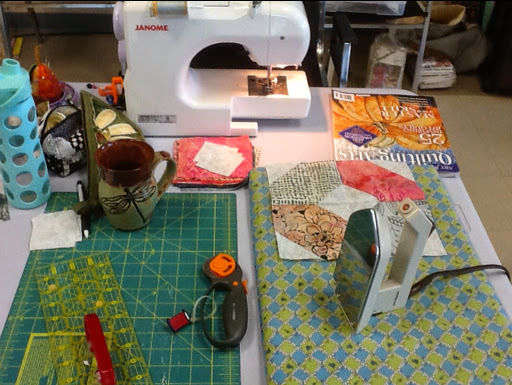 I'm going through a bit of a low phase energy wise lately and pushed myself to head for the sewing studio after lunch today. I wanted something fun and non demanding. My pieces of painted canvas which I did 2 book marks last week from were perfect. This one I've left in one piece as it might be later used for a small pouch. I started with the black loosely going around some white flowers for pop. Then I switched to a metallic bronze for the circles. It's just plain fun--almost like gestural drawing. The pink is Wonderfil Accent, a heavier weight shiny polyester that's great for show. It's fun to see the flowers emerge as you add the stitching. The piece above is a detail of a section I cut off to make 2 more bookmarks. I passed a couple of hours absorbed in stitching once I got started. Now I'm off for a tea break and a rest before dinner. I went to my first UFO day today where I always take a traditional quilting project. I keep one or two packed in containers ready to go. Today, I was doing a few more blocks for my X's and O's batik baby quilt. 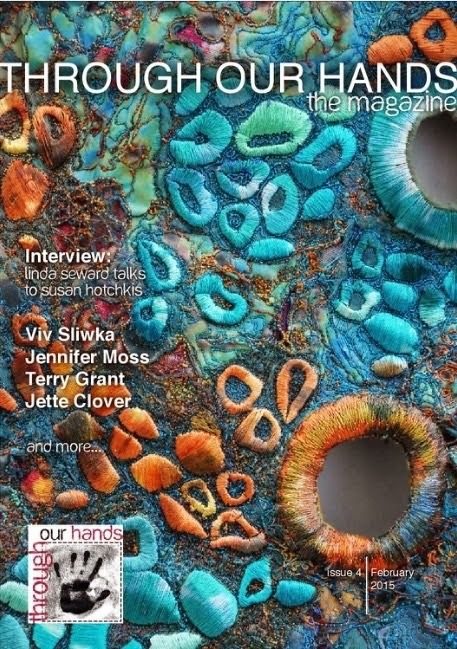 You might notice the copy of Quilting Arts Magazine there. I've been waiting anxiously to see my article in print. It came yesterday. I must say it is pretty exciting and humbling to be amongst such admired artists! Most of the ladies were working on variations of twister projects this morning-- a mini workshop. There was one that will be a pumpkin hanging. It's always a happy day. I love going. After packing away all my retreat projects, reorganizing and setting up my machine again, I felt like doing something creative. 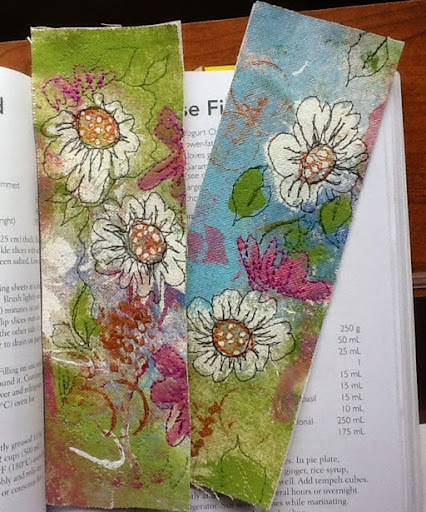 I pulled out my painted canvas and fussy cut a couple of bookmarks. I'm free motion stitching each one and it's a bit labor intensive. When I finish the stitching, I'll add a fabric backing and zig zag the edges. A little fussy, but gift worthy. 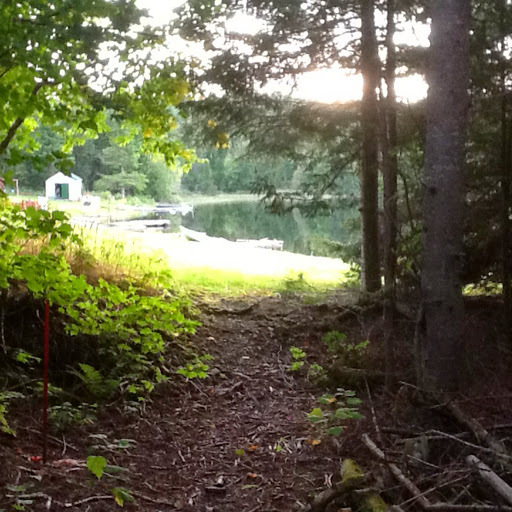 My friend and I just returned from our annual retreat at the Portage Lake camps. It is such a beautiful spot about an hour from town. No electricity (generator), no phones, no TV, no radio. Just us the view, and our sewing. Ours was the second cabin from the left. Most people go up to fish and hunt according to the season. Blueberry season is just finishing and they were plentiful this year. We'd like to bring our life jackets and gear next year too. We can fish and sew! It would give us a little break from the tricky projects like these bags. We made them the first day and I confess they were exasperating. We decided to move onto something simpler the next day. I pieced more blocks for the baby quilt I'm making. I sat outside the first night on the swing with my tea. The freshly baked cookie was delivered to our door by the caretaker who made them. Isn't that sweet? Apparently there is a path that leads all the way around the lake, but one would need an orange vest and perhaps some male company. Lots of moose around. I ventured partway in for some photos. 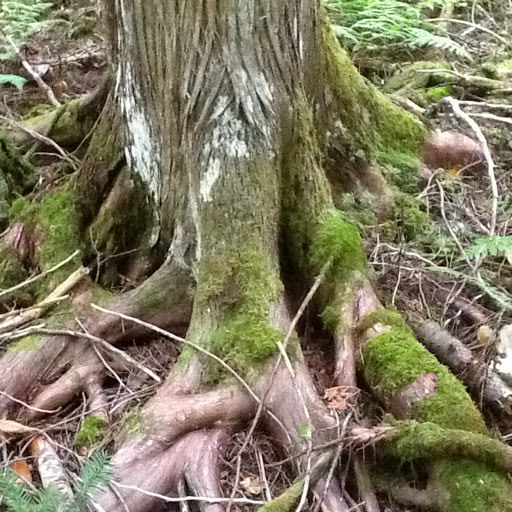 I love tree stumps. One could not tire of this view from the window or the deck. The trees and water changed color every few minutes and the leaves were actually turning more red and golden from one day to the next. These little sojourns that I make into nature sustain me throughout the year. I packed up my sewing machine and a few projects today for a two day quilting retreat I'm going on tomorrow with my son's future mother in law. 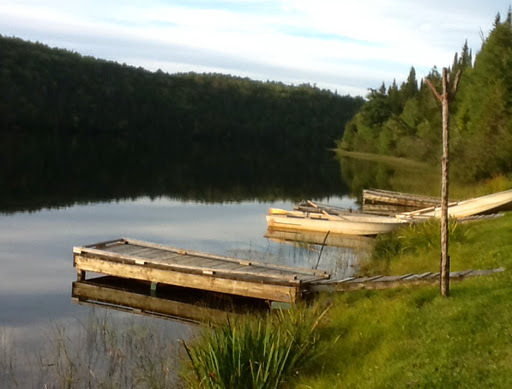 It's about a two hour drive into the mostly uninhabited (save for camps and a park) center of the province where we stay in one of a handful of cabins on a lake. No radio, no TV, no Internet or even a phone. Tonight, I went for a little bike ride across the nearest and flattest part of the trail. It was chilly enough to give me earaches! Even the bees were tucked in for the night. 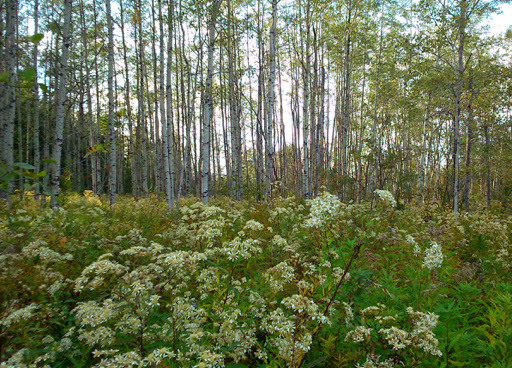 A lot of wildflowers are drying and going to seed. 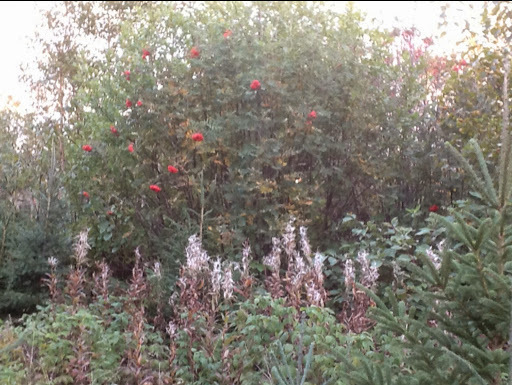 The mountain ash berries are bright red and in some spots the leaves have started to turn golden. Some of the leaves have started to turn, the maple being one of the earliest. I do so enjoy fall and all the changes it brings. I'm sad to say goodbye to swimming in the ocean, but the changing environment manages to catch my attention. Yesterday, I cleared out some of my garden and put up my fall wreath. These pictures were all taken with my I Pad because I was too tired to upload camera photos to my computer. They're not bad. I hope you've all had a great weekend. I'll be back later this week.